(Bloomberg) -- Israeli Prime Minister Benjamin Netanyahu said he would extend sovereignty to areas of the West Bank, an incendiary gambit that suddenly appears within the realm of plausibility, just days before national elections. 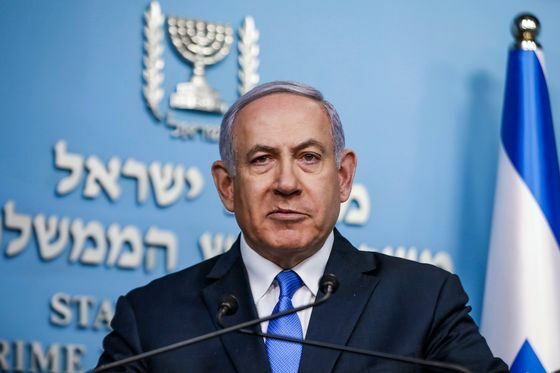 The declaration, in a Saturday night interview with Israeli television, seemed aimed at right-wing voters whose support Netanyahu needs to secure a fifth term April 9. Amid a tight race against former army chief Benny Gantz, the comments on annexation could distract attention from Netanyahu’s potential indictment on bribery and fraud charges in a wide-ranging corruption investigation. For half a century Israeli leaders have resisted such a move, which would draw even more international opprobrium over their control of a Palestinian population that has grown to 2.6 million people. Thanks to President Donald Trump’s recent recognition of Israeli sovereignty in the Golan Heights, there’s now precedent for Israel to claim land it captured in what it describes as a defensive war. Netanyahu’s statements could be historic -- or they could be just another inflammatory pre-election proclamation that he walks back later. That he raised annexation of the West Bank -- the 50-year dream of the Israeli right, but a red line for Palestinians and other Arabs -- shows how tight the upcoming election is. Final polls before the weekend showed Netanyahu’s Likud party trailing Gantz’s centrist Blue & White bloc by several seats. However, Netanyahu still seemed to have the likeliest path to forming the next government at the head of a right-wing coalition. Under the current government, talk of annexing the West Bank has moved from pipe dreams to calls for action by members of the ruling coalition. Opponents have accused the government of already undertaking a creeping annexation through legislation, including by approving the expropriation of privately owned Palestinian land for incorporation into settlements. Piecemeal annexation, they warn, would eventually evolve into full annexation, a situation in which Israel’s Jewish minority might one day rule over a disenfranchised Palestinian majority. Some commentators said Netanyahu’s pledge should be taken with a sizable grain of salt. Gantz told Israel’s Army Radio that he opposed unilateral steps in the West Bank. If Netanyahu does mean what he says, extending sovereignty to parts of the West Bank could fundamentally reshape Israel, its relations with Arab states and with much of the world. For decades, settlement building in areas Israel conquered in the 1967 Middle East war has been condemned by the United Nations and most of the world, including the U.S.
“Such a statement by Netanyahu is not surprising,” veteran Palestinian negotiator Saeb Erekat said on Twitter. “Israel will continue to brazenly violate international law for as long as the international community will continue to reward Israel with impunity." Israel captured the West Bank from Jordan and considers the high ground there essential for its security -- and it’s the cradle of Jewish civilization. Palestinians claim the land for a future state. The West Bank is divided into three categories with varying levels of Palestinian autonomy, based on the Oslo peace accords. Many Jewish settlements are in ‘Area C’, which is largely under Israeli security and civil control. Israeli negotiators have pressed to include the heavily settled areas in sovereign Israel as part of any peace agreement, with land swaps for the Palestinians elsewhere. In the interview, Netanyahu brought up Trump’s decision last month to recognize Israeli sovereignty over the Golan Heights, which Israel captured from Syria in 1967. Speculation had swirled that Israel might use the Golan move as precedent for keeping parts of the West Bank. Unilateral annexation would likely provoke fierce international condemnation and could disrupt the U.S. peace plan, which Trump is expected to present shortly after Israel’s election. Despite his reputation abroad as a hardliner, at home Netanyahu is seen as the one who has kept his more extreme coalition partners from incendiary moves.